Mastering my Right Fit Method and making it your Right Fit Method requires exploration, practice, and behavioral changes. Let's do this together at barro global search's corporate headquarters in Los Angeles. You can put together a group of eight people that share your same need. Perhaps, you were recently downsized along with many of your colleagues and looking for the Right Fit Road to Career Success. Maybe you are questioning whether you want to leave the employee world and become an entrepreneur or you cannot demonstrate to the employer that you are the ONE Right Fit on an interview. Arrange a time to speak with Dr. Arlene (310-443-4277) and discuss her three seminars which she will customize to fit the group's needs. 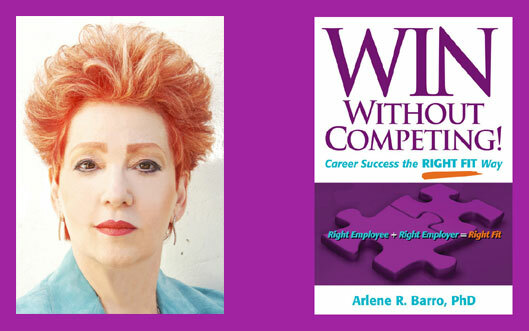 Also, during the conversation, Dr. Arlene will determine with you whether she needs to create another seminar to teach a different component of her Right Fit Method. The goal of this three hour seminar is to figure out your Core Identity right now. What you did in the past is important. But the real question is what do you feel passionate about doing right now. If you have been working just to earn a living and have never experienced your career passion, the time to find that passion is right now. Passion is your career fuel. You need it to feel fulfilled in your career. The seminar will enable you to get in touch with your inner Core which contains the passion. That needs to be awakened like a sleeping giant. Eight people is the right size group to enable self-exploration, facilitate comfortable interactions, and yield results. $75.00 per person, payable via PayPal or personal check 10 calendar days prior to the seminar. To be arranged with the group. The goal of this three hour seminar is to teach you how to broadcast yourself as the Right Fit in emailed, telephone, in-person, audio and video interviews, using my strategies of Pick, Probe, and Pitch by practicing these strategies during the seminar. Mastering the Right Fit questions is a key component to figuring out whether the position is right for you and demonstrating to the employer why you are the Right Fit for them. Learning how to determine what to ask and how to formulate the right questions could be the deciding factor in getting an offer and accepting the right position. Both candidates and employers must probe deeply to really understand each other, prior to the �marriage.� Otherwise, wrong fits are the result. The seminar will enable you to reduce the risk of accepting a wrong fit position. The goal of this three hour seminar is to teach you how to actively take charge of the interview process from the initial contact until you hear �You�re Hired� and even beyond. Selling Your Brand and Sharing Your Brand are entwined. You have to know what to ask the employer and manage the interaction so that you have the opportunity to ask your questions. Identifying the opportunities to speak up, reading the employer�s verbal and non-verbal communication, and understanding the real message are necessary to mastering Manage the Process strategies. To succeed in this endeavor you need to practice and hone your skills. The seminar will enable you to take charge of employer interactions during the interview process which will communicate to the employer that you are a �take charge� person. Most importantly, when you Manage the Process the Right Fit Way you will be able to stop the employer from wanting to interview more candidates. You will show that you are the ONE Right Fit! Pay by PayPal or personal/ business check. Make checks payable to: barro global search, inc.